Looking for Just Host promo codes and coupons? #MasterTheWeb and save money today with our exclusive The Webmaster offers. This a great Promo Code which gives 50% off their VPS hosting for the first month only. This is a great offer that gives a massive 51% per month off the standard $7.99, plus provides a free domain. The offer applies to the first invoice, so sign up for longer to maximize savings. Activate your chosen Shared Hosting Promo Code. When you click the “Reveal Coupon” link on the Just Host Promo Code, you will be taken the home page of the Just Host website. The discounted price and notification of the Free Domain should be clearly displayed. Once you are ready to proceed with your order, click the “Sign up now” button on their homepage. Activate your chosen Shared Hosting Promo Code. © The Webmaster. 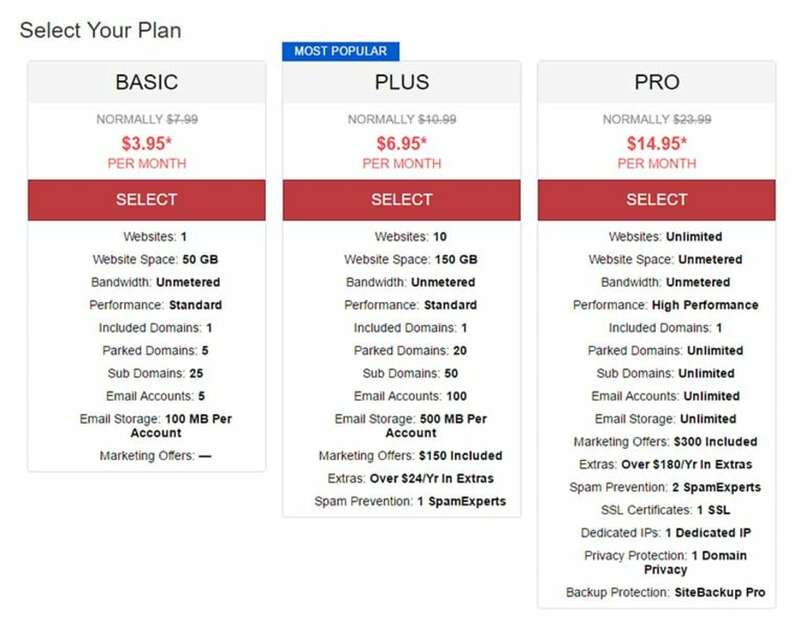 You will have the option to choose from three different plans. You may want to consider the higher cost plans for more features. Select your plan. © The Webmaster. The free domain coupon is pre-populated. You can leave this as it is. The discounts are automatically applied regardless. The free domain is excluded from the money back guarantee, and therefore the cost will be deducted if you decide to cancel within the 30-day money back period. Once you have completed this section, click the “next” button to continue. Complete your domain information. © The Webmaster. Complete billing information, select add-ons and create your account..
You will now have to complete your account and billing information, accept the terms of service, and make sure the order is correct. Once done, you can complete the order. Complete billing information, select add-ons and create your account.. © The Webmaster. Every website is different, so we are unable to provide specific advice for your circumstances. If you’re starting a new website that will not be getting much traffic initially, then you should consider the Basic shared hosting plan. This can then be upgraded once your website grows, either to the Plus, or Pro Plan, or one of their VPS Plans. Before purchasing hosting with Just Host, you may wish to check out our reader’s reviews, and compare features with some of our recommended hosting providers. All these different billing terms can benefit from our promo codes, with larger discounts being available for longer terms. Do Just Host offer a free domain? Yes, every hosting plan comes with a free domain name. According to their website, they accept American Express, Discover, Master Card, Visa, and PayPal. Does Just Host accept PayPal? Yes, Just Host do accept PayPal. Does Just Host accept Bitcoin? There is a 30-day money-back guarantee, but this does not include add-ons like domain names. Where you have received a free domain, a fee will be deducted upon cancellation under this policy. Yes, the cost of hosting will go up once you renew as the initial discount offered by our coupons only applies to the first invoice. During the order process, the discounted rate and the renewal rate are clearly shown. Do I need the Site Backup and Restore Pro offered by Just Host? A web hosting provider’s backup service can provide a convenient way to restore your website in the event of failure, but we believe it should not form part of your disaster backup strategy. We always recommend taking off-site backups that are fully in your control. This may be done at an application layer such as WordPress specific backups (i.e. VaultPress, or CodeGuard), or on a more comprehensive account level (i.e. backup of your cPanel account). Just make sure you don’t have to rely on your host if your website needs to be restored.